Deep Brain Stimulation (DBS) has shown particular effectiveness in treating symptoms associated with movement disorders, but uncertainty still looms over the most effective spots to target, and surgeons need a more automated way of testing the implanted electrodes. As part of his AFR PhD project at the Centre Hospitalier de Luxembourg (CHL), computer scientist Dr Andreas Husch developed innovative image-based computational approaches to aid DBS, which are already being used by scientists across the world. 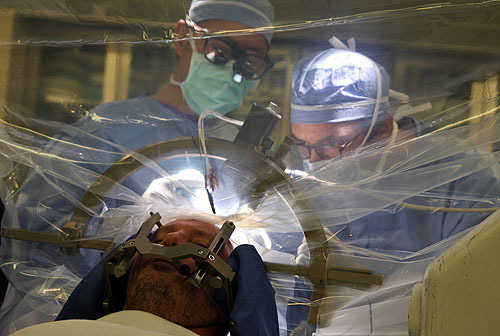 Deep brain stimulation (DBS) is an intervention based on implanting permanent electrodes into the human brain to alleviate the symptoms of various movement and neuropsychiatric disorders, such as tremors, dystonia and Parkinson’s disease. The first DBS experiments took place about 60 years ago, modern DBS treatments have been around for some 30 years – but open questions remain. A key problem in DBS research is the question of the precise definition of the optimal stimulation targets for the treatment of different diseases, particularly for Parkinson’s disease. “My project was highly translational – I spent a lot of time observing surgeries, trying to understand the needs of the surgeons – essentially requirements engineering: what do they really need and how can we help with computer science,” Andreas explains. “Originally, my project was meant to focus on improving the intra-operative phase, but during the project new developments in the field changed the focus to post-operative,” Andreas explains. The reason was new developments with electrodes for DBS use: Traditionally, four contacts are implanted in the brain for DBS, however, now it is possible to have as many as eight with more complex shares, enabling a “steering” of the current in a certain direction . “This makes the post-operative part much more complex, naturally, as you are working with more contacts and there is a significantly larger amount time required for programming the stimulator, due to a situation known as a “combinatorial explosion”. This created an urgent need to come up with post-operative aid for surgeons,” Andreas explains. This led Andreas to come up with the ‘PaCER’ algorithm, which is currently the most precise and only fully automatic algorithm published to recover post-operative electrode from CT data. The overall goal of the project was to create the means to allow objective and as far as possible automatic assessment and support of a personalised deep brain stimulation process. These novel means contribute to a better understanding of the action of DBS in an individual subject and may enable improved therapy by providing personalised computational guidance of the physician. Reconstruction of two electrodes at different time points after surgery (blue / red). The electrodes are displayed with the subcortical structures estimated from a so-called ‘brain-atlas’. The target structures are visualised in green. Phantom device produced by computer aided turning of an acrylic glass cube, supported by Trier University of Applied Sciences. The device has two electrodes “implanted” in it: one following a straight line and one a curved trajectory. 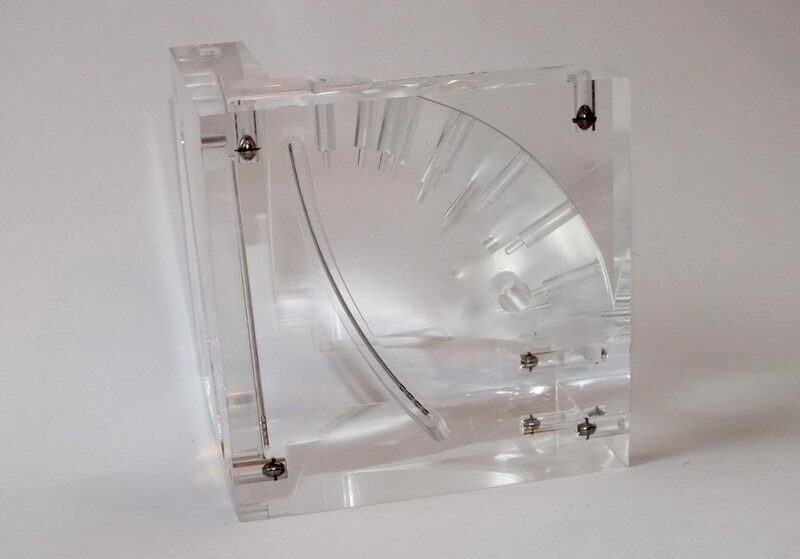 As the exact positions of the electrodes within the acrylic glass are known by using two titanium balls implanted as reference, it could be used to precisely assess the accuracy of the algorithm. 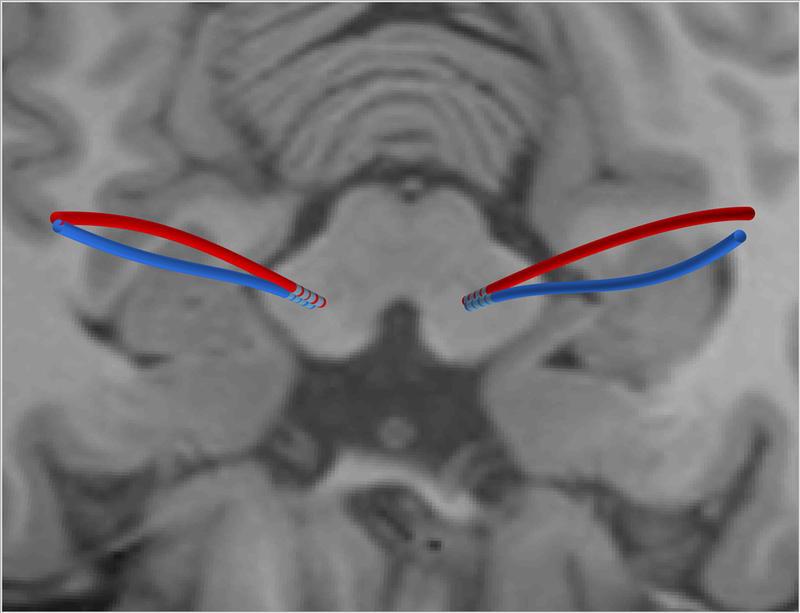 PaCER DBS electrode reconstructions (in blue) displayed with relevant white-matter fiber bundles recovered from diffusion-weighted MR imaging and manual models of the target structures (yellow). Simulated interaction of the electric field induced by the stimulation with the fibers are overlayed. To patent or open source? 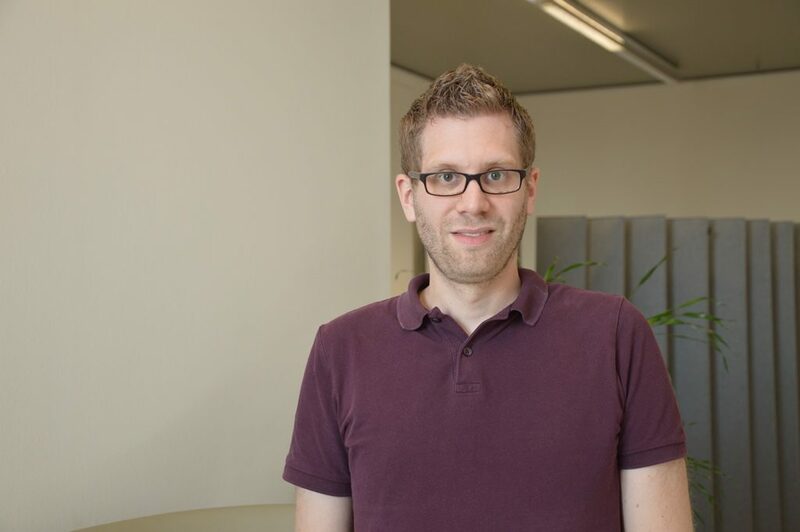 “We decided to open source it, we also thought this would be better for Luxembourg and could help establish us more in the scientific community”, Andreas explains. 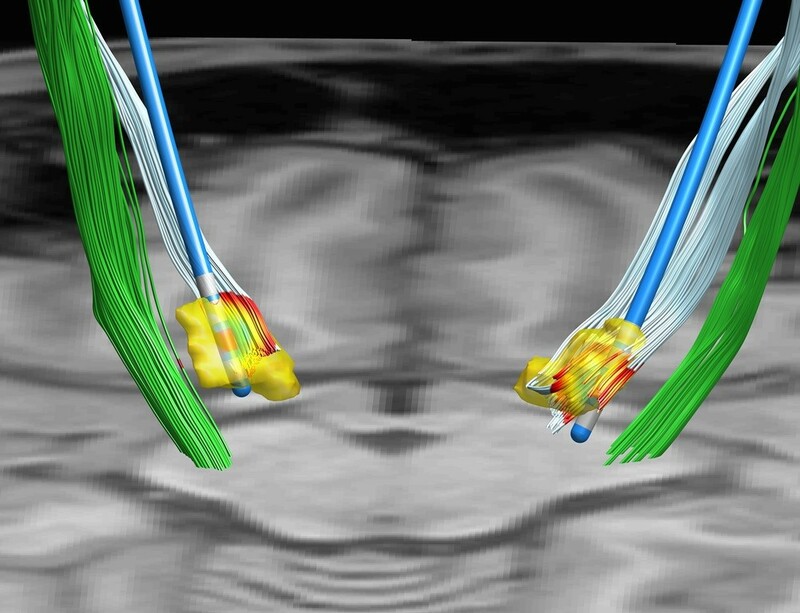 For example, PaCER has been adopted by the LeadDBS group (coordinated at Charité Berlin), and was integrated in their leading deep brain stimulation research software package, making it accessible to researchers around the globe. Andreas explains that it takes quite some time to learn how to operate the LeadDBS tool, and that he therefore wanted something more automated to help to DBS surgeons. “We teamed up with Mikkel Petersen from the University of Aarhus, Denmark, and tried to bring PaCER into an automatic pipeline. To help a doctor you need an estimate of the individual brain structure of the patient and bring it together with lead reconstruction. 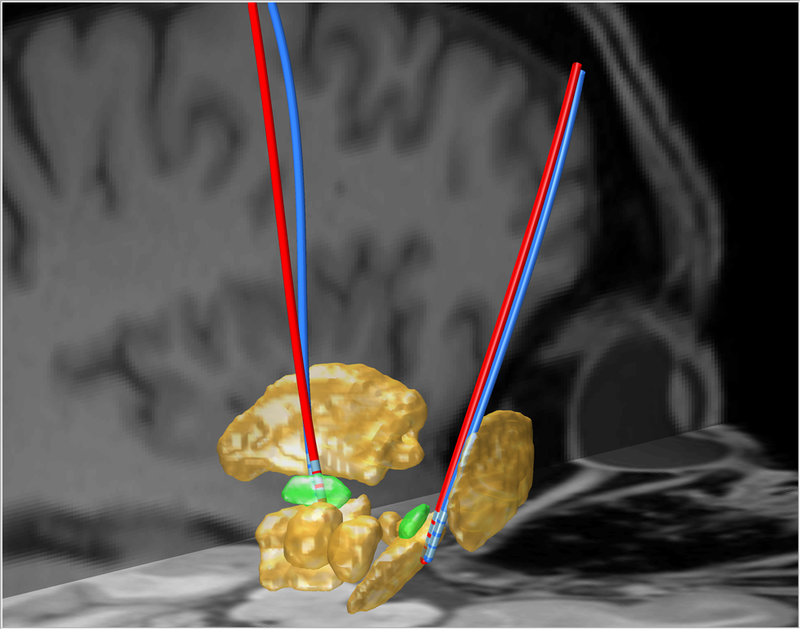 “For this method, you combine ATLAS MRI data with PaCER data and it outputs it as a fully interactive 3D PDF. This helps you see how well placed the contacts / electrodes are. It helps give the neurologist an idea of how they can improve without having to test everything. It can also calculate some metrics, e.g. whether the contact is inside or outside of the target structure. While this is still a prototype the idea is to show how it could be used clinically,” Andreas explains, adding that the collaborators in Denmark also ran a small independent clinical validation study, in which they were quickly able to apply the methods to their clinical data. When asked whether PaCER could become the standard for post-operative DBS, Andreas explains that it could, but that it would still need some extensions, and company involvement to get a CE mark. In September 2018, Andreas Husch was presented with an award sponsored by InSilicoTrials in collaboration with the VPH Institute for his PhD work, in particular the improvements to the post-operative phase of DBS. The award is presented to individuals for outstanding achievements during their PhD thesis, specifically focusing on the translational aspects of their work. Dr Husch was also recently invited to give a talk in Shanghai, which covered the key contributions of thesis. The talk was delivered together with Prof Dr Frank Hertel, Dr Husch’s PhD co-supervisor. Dr Husch’s AFR PhD project was carried out at the Centre Hospitalier de Luxembourg (CHL), in collaboration with the University of Luxembourg, the LCSB and Hochschule Trier. Dr Husch is currently Postdoc at the LCSB at the University of Luxembourg.